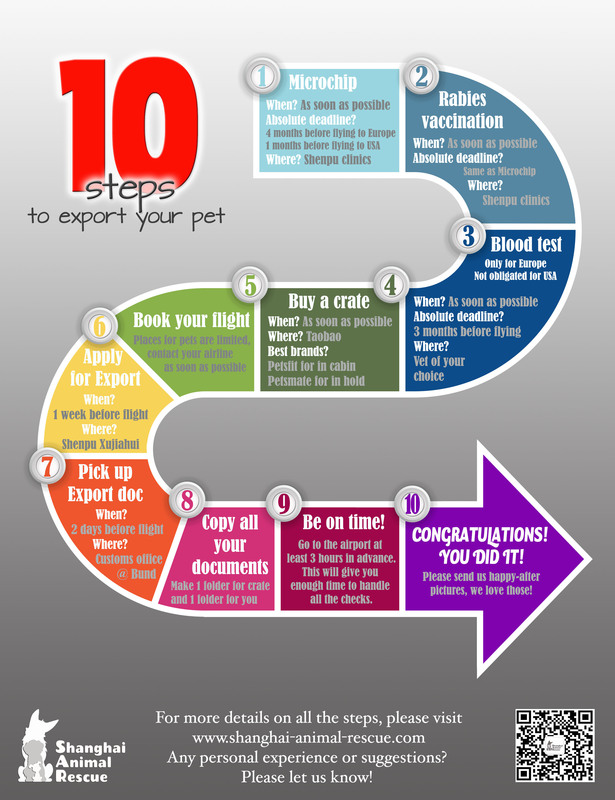 Taking your pet abroad, it sounds like an enormous task. Many posts have been made about rules and procedure. Almost all mention you should start 4 to 5 months before you leave. So most people calculate their leaving date minus those months. And then you get full blown stress once the due dates are up…BUT that 4 to 5 months legal waiting period is actually a MINIMUM. You can easily start the process NOW, regardless off when your departure date is. Benefits of starting export procedure now! Its a small chip that has a unique 15 number code. This code is stored in a database, connected with your information. Its implanted in the neck of your dog with a special syringe. No sedatives are given (just a pinch in the neck) so most dogs are not happy about it. In theory, any vet that gives ISO certified microchips. But to avoid any problems, we strongly recommend to go to Shenpu clinics. Note: Shenpu clinics are open 8.30 am – 9 pm every day. (Xuhui even 24/7). But for registration best go between 9 am and 5 pm. You do NOT need an appointment, simply walk in. As soon as possible! Although Shanghai Dog License is NOT connected to the export procedure, they require the same microchip. So no need to wait. Puppies however need to be at least 12 weeks old, as they are still growing, the chip can move. If you wait until last minute, this has to be done minimum 4 to 5 months before your pets departure date. But really do not recommend that as many things can go wrong. Your dog and your passport. 1. Go to an official Shenpu clinic, they can do Rabies vaccination at same time. So you can combine step 1 and step 2. – Take video with your phone when the chip is implanted, you can show the Customs officer if they can not find it. ONLY Shenpu clinics are authorised to give rabies vaccination for export. Same as Microchip, as soon as possible as you need it for Shanghai Dog License too. Again, If you wait until last minute, this has to be done minimum 4 to 5 months before your pooch departure date. Take into consideration that puppies need to be at least 16 weeks old and any Rabies vaccine given before Microchip is implanted or given by vets other then Shenpu, are not valid. 1. Besides the Rabies vaccine, your dog will also need normal vaccines against Distemper and Parvo etc. Most used in Shanghai is the Vanguard 5 vaccine. Your vet should have given this to your dog at his first check. If your vet did not do this, you can combine this with Rabies vaccine but it is not recommended. Both are an attack on your dogs immune system so it is good to keep them a week separate. 2. For Shanghai dog license, you can get Rabies & Chip at different vets. These Rabies vaccines are NOT valid for export. Only Shenpu is allowed to hand out the Blue Vaccination Book that you need for export. So to make export in the end easier, go to Shenpu for your dog license. After these two steps, there is a legal waiting period of minimum 30 DAYS before you can take the next step of the export procedure. This is done to make sure your dog builds up enough antibodies against Rabies. If you are moving to USA, you can skip this step. There is no bloodiest required for export to USA. 30 days after Rabies vaccination, your doggy will need a blood test to check if he has enough antibodies. 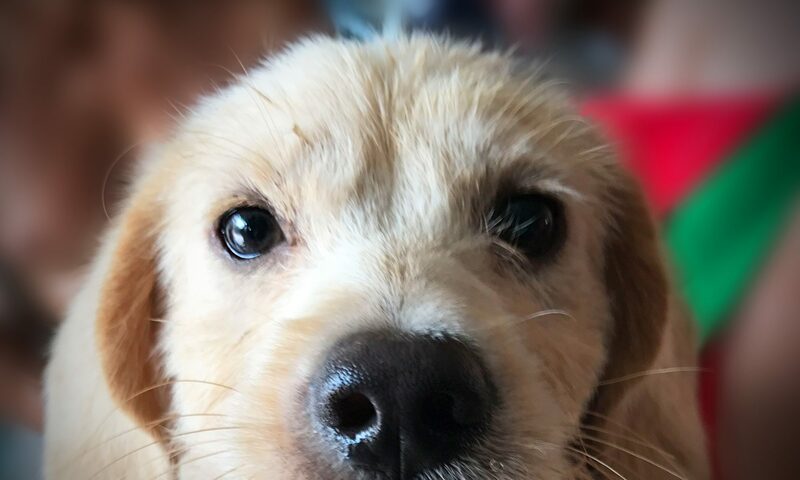 Make sure the vet also checks his microchip as it has been known to happen, dogs loose their microchips… The options here depend on your ability to speak Chinese and the effort you are willing to put in. 1. Contact the lab in ChangChun. Unfortunately they only speak Chinese. The Serum Submissive Form and specifications of packaging change often. So please confirm that you are following the correct procedure. 2. Go to any vet of your choice and explain why you need a blood sample. Average cost for blood drawing is about 200 RMB. 3. Arrange temperature controlled kuaidi to lab in Changchun. Average cost about 30 RMB. 4. Pay the lab 300 RMB, possible by PayPal. Within 15 days, they will send you the result. There are many clinics in Shanghai that offer a complete deal, from drawing the blood to getting the test result for you. One of the most interesting one is St. Anthonys (440 Hāmì Lù, Xianxiá Lù 哈密路440号 近仙霞路 Tel. 3208 2880). The total package, including test in a German laboratory there will set you back 1.500 RMB. Please note that also Shenpu Hospitals offer this service. Price there is around 2.500 RMB. The Rabies vaccination is obligated to be performed in Shenpu but the bloodtest is not. You are free to choose cheaper options. The result of the bloodtest stays valid if you keep your dogs Rabies Vaccinations within one year of each other. So even if you are planning to leave next year or later, you can have bloodtest done now. This is another reason why it is a good idea to start sooner then the minimum of 4 to 5 months. To pass the test, your dogs result has to be bigger or exactly 0.5 IU/ml. If your dog doesn’t pass, it does NOT mean he has rabies, it means he doesn’t have enough anti-bodies yet. If your dog did not pass the test, get him a booster Rabies asap. This one you can get at any clinic. Then after one week, do another bloodtest. If you wait until last minute, this can cause a lot of problems as it delays his departure date. So start now and avoid all stress. Counting from the day that the blood was taken for the blood test, there is a legal waiting period of minimum 90 days. After this, your pet is allowed to fly. Now this all depends on the size of your dog. Measure him standing up from nose to beginning of tail and from feet to top of his head. Your dog must be able to lie down, stand up and turn comfortable in the crate. Again, don’t wait last minute to do this, the sooner you buy it, the more comfortable your dog will be. Make it his happy and safe place. You can take the door of the crate and award your dog with treats whenever he goes in there. He will start to associate the crate to a positive event. Every airline has their own rules for allowing small pets in cabin. So please check the specific regulations. 2. Maximum measurements of crate: 46Lx28Wx24H cm. Your pet must be able to stand up and lay down comfortably. Travel bags of Petsfit are perfect for this. Just type in Petsfit猫包 in Taobao. We went for Medium size which is a bit too big but the bags are only weight, not measured. On day of flight, just but peepad in. No need to put water bottle or food tray as you can put those in your hand luggage. When your dog can fly on same flight as yourself, you can check him in like you check in your luggage. The crate will be placed in a special compartiment of the airplane with airconditioning. 1. As with all crates, your dog has to be able to stand up, lie down and turn. To determine the size, measure your dog as mentioned above. Sky kennel, Iris or Petmate Crates are best. You can find them and many on alternatives on Taobao. 2. The crate must be designed to be leakproof. 4. Ventilation holes on at least three sides. 4. Put “Live animal” stickers on every side of the crate. As they are impossible to find finished, you can just print your own. Just put the templates you find below on a memory stick. Then go to office supply store and buy sticker paper. Do not buy the cheapest paper as they will come loose easy. Then take the sticker paper and your memory stick to your local print shop. Make sure they print them as “glossy”, otherwise the ink will come right off. The whole process will cost you 50 RMB maximum. Arrows you can put all around. Last two just cut in half to fit on crate. Price for crates as luggage are very different per airline and per size. For more information, please check the websites of your chosen airline. For big dogs, it is very important to confirm that there is room for XL crates on the flight, more about that later. The option to avoid at all cost because it comes with a big price tag and your pet will be travelling longer. This option requires you use an agent and these guys charge big. Just to stand beside you at airport, they will ask 800 RMB or even charge for export document double, they just give it another name… If there really is no other option, please consult the Cargo section of your chosen airline to arrange this. If you have severe anxiety without your beloved pet by your side, you can apply for an ESA-certificate. This will allow you to take your pet into cabin with you, even when he is over 8 kg. Not all airlines accept this but KLM and AirFrance do. When you book your flight, immediately contact customer service and specify you will have an ESA pet with you. These are the first 4 steps, you can do well in advance. Most important is to keep the Rabies Vaccinations within one year of each other and use Shenpu for this. Then the bloodtest will stay valid and you can leave anytime… When the time to leave comes closer, all you need to do is step 5 to 10. Both for in Cabin and As Luggage option, its important you book your flight well in advance. If your dog flies Cargo, you can skip this step as you need to arrange directly with Cargo Department of the airline. If you have a snub nosed dog (for exemple bulldogs) please take a close look to restrictions as not every airline takes them on their flight. Airlines only allow a certain number of animals in cabin per flight. As the dog will have to be placed under the seat in front of you,you can only take one pet per person, The space is limited for one pet. If put with luggage, the crate of your dog will be put in a special “room’ in the airplane. It is next to the storage of the suitcases but it has air-conditioning and heating system. This “room” however, is very limited in space. Depending on the airline, you can take multiple pets per passport. For example, KLM and AirFrance have a limit of 3 pets per passport. Minimum age of the passenger is 18 when not accompanied by an adult. Both options are based on First come, First served principle. So as soon as you have your booking number, contact Customer Service and book that room for your dog! Your dogs booking will be confirmed on your E-ticket.Please call Customer Service before you book your own ticket. Some airlines unfortunately to not allow to change your ticket when there is no room for your dog. If you book your trip in two stages, with a transfer, be careful and ALWAYS CHECK IF YOUR DOG CAN GO ON BOTH FLIGHTS. For example flying to Moscow first with Aeroflot and then a second flight with another airline, will require an import permit of your dog for Moscow. Also the flight within Europe are usually done with smaller airplanes like Cityhopper. As the planes are smaller, so is the room for crates. This can be a problem when flying with multiple pets or with a big size pet. To ensure the pets health in heat of summer and cold of winter, many airlines have travel bans for pets during this time. Always double check if there is no ban at the time that you will be flying. Again, for both flights as some of the transfer airplanes can not heat the hold in winter. Shenpu official vet 565 Xujiahui Lu, near Liyuan Lu 徐家汇路565号 Tel. 5301 8000. No appointment needed, you can simply walk in. Shenpu vets will perform a general health check and check all your documents. You will be asked to go to second floor and fill in Export form. Make sure you are awake because this document is very important. You will be asked to fill in your name, adress in Shanghai, adress in your home country and phone numbers. Then you need to fill in your dogs information, pay special attention to the dates. They have to be exactly same as in his Blue Vaccination Book. You will walk out with a paper that to pick up documents DO NOT LOOSE IT! Customs office at the Bund. 13 Zhong Shan Dong Yi Road, close to Fuzhou Road. 中山东一路13号, 南京东路. Opening hours 8:30-11:30 and 1-4pm. At entry, security will ask you to note your passport number in the visitors log. Go to third floor, enter the door on your left and walk to the counter all the way in the back. Hand over the paper from Shenpu to the lady. When the she gives you the papers, check all the information and especially the dates. If something is wrong, ask her to correct it as it is VERYimportant. These paper are valid for 10 days so if anything goes wrong with your flight, you have 10 days to rebook. Even after landing, keep these papers close. You need them to apply for an European passport for your dog. Copy every single document you have, just to be sure you have back-up in case something is missing. Put them in a nice folder. Customs officers will appreciate it. Put one folder in your handluggage and one folder on the transport crate. 1. Arrive at the airport at least 3 hours before boarding time. 2. Put the dog in the crate, Pudong airport does not allow “loose” dogs. 3. Go check in yourself like always, they will weigh the crate and give you the bill to transport the dog. 4. Go to the counter to pay the bill, some airlines only accept Euro or cash RMB so have both ready. 5. Walk back to the check-in and ask for last check-in time for your dog if he is going in hold. 6. Airline personnel will tape documents onto the crate. You can put a kitchen ZIP bag with some food on top of the crate and an extra water bottle. If you are delayed, your pet will have some water & food. 7. You can go back outside for a good nice walk. RELAX, if you are stressed, your dog will pick up on that. 8. When its time to go, put doggy in crate. Remove your dogs collar and leash so he can not get caught in it. And have the door secured with strips at airport. 9. If your dog goes in the hold, go to the “Special luggage” desk and give your dog a last kiss. When your dog goes with you in cabin, you can just take him through Customs with you. So no need to go to the “Special Luggage Desk” . You will need to take him out of crate for X-Ray so be prepared for that. When you arrive in at your destination, pick up your pet from the “Special Luggage Desk” if he travelled as Luggage. Just walk through Customs, like you always do. If they stop you, hand over your folder with all the documents. Here is where the Chip Reader comes in handy. Walk out of the airport and start your amazing new life with your best friend on your side. If you have any remarks or suggestions, please let us know! Also any happy after-pictures are greatly appreciated, we love those ?